Luxury 6,000sq. ft. 4 bed en-suite beachfront villa with pool, gazebo & sundeck. Kingfisher is Grenada's premier beachfront villa, located on a delightful secluded white sand beach at the end of Turtle Back Drive in L' Anse Aux Epines, overlooking Mt. Hartman bay, it enjoys cooling breezes year round, facing the reef strewn Atlantic. Without doubt, Kingfisher is the best located beach front villa in exclusive L'Anse Aux Epines, ideal for couples or families with children. Elegantly designed and set in a beautiful tropical garden, it has a stunning 200' frontage, comprising six separate vaulted buildings connected by a purpleheart walkway, is furnished throughout in Lombok teak, comprises 4 en-suite air-conditioned bedrooms (2 master, 2 guest), pool, private plunge pool, enormous entertaining area (candlelit at night), modern designer kitchen, a lounge opening onto the pool, a Balinese gazebo, boat house with viewing area overlooking secluded beach ideal for all water-sports. If you are seeking Grenada's best luxury beachfront villa, Kingfisher must be your choice. Kingfisher: A place to 'LIve, Love, Laugh': Owner Will King (founder of British men's shaving brand King of Shaves) was introduced to Grenada in 1992. In 1996, he discovered an acre and a half of prime beach front land was available, and with his then wife, bought the land. In 1999, Kingfisher was built (originally called Secret Cove, due to the proximity of Secret Harbour hotel, sadly now closed destined to be the site of Four Seasons Private Residences). King, a keen yachtsman and windsurfer fell in love with the location, due to its constant cooling breeze (ensuring mosquitoes were a rarity) and the fact he could enjoy fantastic windsurfing in Mt. Hartman bay. Between May 1999-Sept 2002 he kept his 45' yacht, 'Face to Ace IV' there and competed in Grenada Sailing Week, (winning his class in 2000). Originally wooded, the land was cleared and landscaped with mango, lemon & lime and a Flamboyant tree, and re-planted at the front with coconut palms. In 2004 a Balinese style gazebo was completed, along with a boat house. Bespoke: Fiona MacIntyre of FAS Villa Management will make sure if there are any problems, they are resolved speedily and to your satisfaction. Sandra, our Maid has been with us for over 3 years, and as you can see from the guest testimonies (12 five star reviews), takes great pride in her work. As Mr. King is in the business of exceeding customer expectations with his own business, so he carries on this objective with what is his home, when he is not in the UK. (Please, do not hesitate to contact owner for further details or website links). NB. The villa is named Kingfisher as Will's son Cameron's middle name is Halcyon (Greek for Kingfisher) which refers to a bird fabled to breed about the time of the winter solstice in a nest floating on the sea and to charm the wind and waves so that the sea was then specially calm, hence the saying halcyon days! Founder, CEO of The King of Shaves Company. We bought the land in late 1996, undeveloped and Kingfisher was built between 1999-2000. I have been visiting Grenada since 1992, and am a Grenadian Citizen. One of very few villas in Grenada with it's 'own' beach at the end of the garden. Bathrooms are European, with whitewashed vaulted ceilings, Grohe shower heads, twin washbasins and over-sized mirrors. Water is provided via the twin Solar System arrangement. Dinner at Kingfisher is spectacular, the dozens of candles are available, along with fire lanterns and more. Kim's catering can provide bespoke catering, alternatively sushi & sashimi dishes can be provided by our friends at Carib Sushi. Fireflies are all around (in season) and music is available via the portable iPod soundsystem. With it's cooling ocean breeze, cocktails at sunset are a must, as is breakfast taken under the balinese style gazebo. In fact, guests often choose to sleep on one of the twin oversized daybeds (mosquito spray and sheets advised!). Airport transfers and welcome pack including a case of Carib & 2 bottles of wine are included in either high or low season. Many options can be specified including breakfast preparation, chef, daily maid service (normal maid service is twice weekly), diving collection (from own beach) and much, much, much more. Please discuss your requirements with the Owner prior to booking. So pleased you stayed with us & had a wonderful time! We hope you had a great time sailing too, and thank you for your lovely review. Gosh, we loved Kingfisher and loved Grenada. Although not in the first flush of youth the villa is in a terrific location, beautifully equipped with masses of space for 8 guests. It's definitely equipped as home rather than a holiday let so has every convenience that's often lacking; comfy beds, great showers, endless kitchen appliances, beach towels & mats, interesting art work. It's kept spotlessly clean by the gem that is Tessa, she'll also cook local food if you require. Fiona, who manages the villa was on hand, although we didn't need here she rang regularly to check we were having a good time. We ate out, had BBQs, climbed Mount Qua Qua, jumped in the waterfalls, sailed in the bays, snorkelled with turtles, went SCUBA diving and drank plenty of rum punch. Wouldn't hesitate to fully recommend. Thanks Will, hopefully we'll return. This is our 5th visit to Kingfisher ,once again we had an amazing holiday . A big thank you to Tessa who is a fantastic housekeeper. Grenada is an amazing island its great to see that the economy is picking up and the island is busy and prospering. Great things happening at Secret Harbour this venue is well worth a visit and its so close to the Villa. We are looking forward to returning in December for our Christmas Holiday and those very Special Sunday afternoon sessions at the Aquarium ! So lovely to have you guys return again. Can't believe it's your 5th visit! Many Hanks! A group of four couples from Weatherby Lake MO, near Kansas City MO, USA enjoyed the Kingfisher Estate for 8 great days. The property was perfectly suited for us in that there were four very nice separate living units, each complete with a full bath or shower. The sleeping rooms were air conditioned. The common areas included a large kitchen and living room indoors and a covered dining area adjacent to a nice swimming pool. The property was modern, well equipped and well maintained. The management company reps were responsive, friendly and helpful. They arranged a driver for our group, Francis, who truly made the trip delightful. We were participating in the Grenada Yacht Week regatta so unfortunately did not have an opportunity to take full advantage of the property. The grounds were beautiful and the storage shed was stocked with all kinds of water toys we unfortunately did not have time to utilize. I highly recommend this property. Kingfisher Villa is luxurious and delightful villa situated in the quiet residential area overlooking Mt. Hartman bay. The villa offers a great sense of privacy and has access to a private secluded beach; which the family enjoyed bathing in. Equally as an avid angler, it too, offered great fishing (caught quite a few decent size snappers, especially in the evening). There is respectable size swimming pool to laze around in and a beautiful landscaped garden offering an array of exotic fruits (Julie mango, coconuts, sugar apple etc).The rooms were very spacious; all with luxuriously decorated en suite bathrooms. The master suite also had a safe, in which you can put all your valuables in. The maid service is first class and keeps the villa very clean, replacing towels, soaps etc. The agent is fantastic too, very friendly and very helpful. The only thing to be mindful off is that you would need a car (which we hired) to get into the main town or Grand Anse area, so bear that in mine. Having said so, the walk into the main shopping area in Grand Anse, is possible, but would take you a good 30 minutes (I often did so when I wanted a bit of exercise). The Villa is also 10 minutes walk to Lance Aux Epines beach. Overall we were very pleased with our stay and plan to go back to the villa again, in the near future. We stayed at Kingfisher villa for 2 weeks and had a wonderful holiday. Kingfisher is in the perfect location for seclusion and only a 5 minute drive from all the amenities you will need. Plenty of lovely restaurants within easy reach. Kingfisher has everything you desire to make your stay perfect. All mod cons but still keeping the feeling of belonging in the Island. We enjoyed the pool and having the beach and the ocean at the bottom of the lovely garden. The kayaks available for our use were great fun. Grenada is beautiful, the sea , the beaches, the hills , the people and the list goes on. There is a 9 hole golf course which was a joy to play. Well kept and understated in the tourist literature. We played 5 times and would have played more had we realised earlier on how challenging and lovely it is. Very reasonably priced too. There is so much to see and do on the Island for all ages . Our youngest being 11 and our oldest being 88! In our opinion Grenada is one of the finest Caribbean islands! Kingfisher was the perfect villa for our holiday. I'm delighted you all enjoyed a great stay, and you loved Grenada. Thank you for the review! Kingfisher is a beautiful 6,000 sq. ft. 4 bed en-suite beachfront villa with pool in one and a half acres of mature landscaped tropical garden, located at the end of Turtle Back Drive, a quiet lane in delightful L'Anse Aux Epines, Grenada. Exquisitely furnished, with all bedrooms en-suite and of course air-conditioned (2 master suites, 2 guest suites). Entirely furnished with teak furniture from Lombok, a European quality kitchen, private plunge pool, Balinese gazebo, boathouse with viewing & sunbathing platform and sandy beach. Suits couples (each bedroom is an individual building) or families (extremely child safe, entirely contained, super large child safe garden). Use of 3 surf canoes. Just 10 minutes from the airport or to Grand Anse. Restaurants including Aquarium, Beach House, Carib Sushi, Coconut Beach, La Luna & Rhodes at Calabash just a short drive away, owner knows all restaurateurs personally. Kingfisher IS Grenada's best luxury beachfront villa. Bar none. 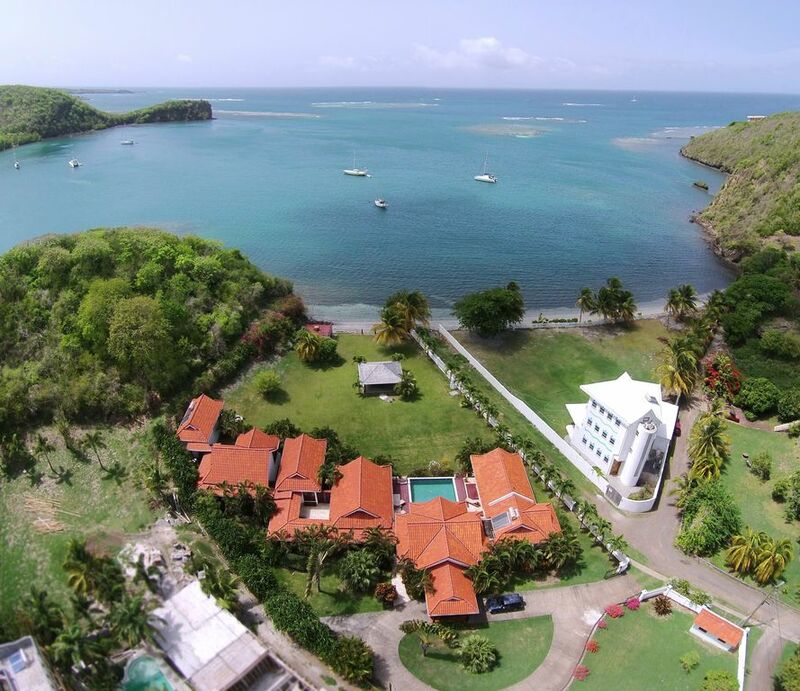 Golf: Grenada has a delightful 9 hole golf course, about 10 minutes drive from Kingfisher Villa. Security deposit required, advised on booking. Booking details, terms & conditions supplied separately. As the villa contains many items, guests will be required to sign a 'checklist' as breakages will be deducted from the security deposit. Local (island) phone calls are free, international phone calls if made WILL be charged for. Car rental may be arranged through our partner, FAS. E&OE.